The Earth. A scintillating, heavenly blue orb with conditions miraculously ideal for abundant life. Not until just a few decades ago were we able to behold images of our small jewel of a planet, alone in the infinite depth of space. Until recently, the Earth must have seemed limitless. Who could stand atop a mountain or at the edge of a great ocean and think otherwise? As well, the Earth’s ability to provide and sustain life seemed limitless. Tales of magnificent herds of bison, and salmon runs so dense that one could cross a river on the backs of fish, serve as a reminder of the abundance that our ancestors once knew. Since the advent of the modern human species, homo sapiens, perhaps a couple hundred thousand years ago, humans have been incredibly successful. They developed tools and colonized continents, fueled by the food they were able to gather and hunt as they went. The transition to agricultural societies occurred around ten thousand years ago, and laid the groundwork for greater population growth. Around 200 years ago, the Industrial Revolution ushered in the ability to harness the power of nature like never before, and just within the past century have technological advances enabled an unprecedented transformation of human cultures, population, and capabilities. In the relative blink of an eye, we have become the dominant life form on Earth. Now, we must come to terms with our success. 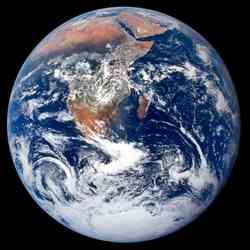 As our numbers have swelled to almost seven billion, we are having more of an impact on our home planet than ever before. Natural resources like arable land, fisheries, and petroleum are being consumed at unprecedented and unsustainable rates. The behaviors that made us so “successful” are now threatening the harmonious balance of life. Our genetic programming and cultural memory, developed over the millennia, offer little guidance as we try to adapt to this new and challenging situation. We are suddenly being forced to recognize that there are limits to the resources that the Earth can provide, and limits to our own exponential growth. Our economy, based on the principle of continuous and unending growth, is a perfect example of our old way of thinking. Our monetary system, which originated with trading coins, beads, shells, and the like, in exchange for goods and services, is now based on electronic transactions in which the numbers are rapidly growing and have no practical limit. Financial innovations such as debt (borrowing from the future) and fractional reserve banking (loaning out money that doesn’t exist) have helped to provide the rationale for hyper-speed economic growth and consumption. However, they never provided the means for that growth, which has always been bounded by the available human and natural resources. How can we bridge the conceptual gap between our consumer culture, which is wired for continuous growth, and the natural world, which has exceeded its comfortable limit? If we want to preserve or enhance what’s left of the natural world, then it follows that a change in our culture is needed. Since we are limited to what nature can provide sustainably, it seems that we would benefit most by learning directly from nature itself. Permaculture design and biomimicry teach us to create systems that reflect natural patterns. Natural systems work endlessly in interconnected and unbroken cycles. They are powered exclusively by renewable resources such as sun, wind, tides, and temperatures. There is no “waste” in a natural system, since the waste of one process is fuel for another, fostering a healthy balance among all elements in the system. These kinds of sustainable development principles are starting to find their way into our culture and bringing about much-needed change. Finding, encouraging, and investing in people, communities, and businesses that harness these principles is the essence of what we do at Natural Investments. As we begin the second decade of a new millennium, hopefully we can slow down long enough to take stock of our situation and develop some brilliant solutions − not more economic Ponzi schemes that cleverly steal from the future, but real solutions that encourage balance, harmony, and sustainable abundance for all. If we can understand that, right now, the key to a healthy and prosperous planet lies in our hands, hearts, and minds, we will be well on our way to achieving the much-needed cultural shift that will enable a bright future for all life on Earth.